Clean chicken thoroughly (Do not cut up). 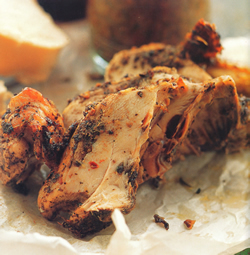 Season chicken with salt and garlic powder to your taste. 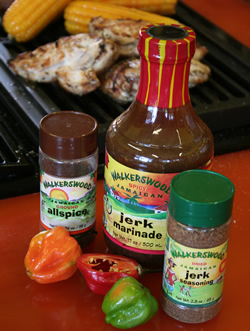 Rub Walkerswood Jerk Seasoning on chicken inside and out. Cut up small onion and stuff in middle of chicken. Let chicken sit in refrigerator overnight. Preheat oven to 375 degrees when ready to bake. Open a can of beer and place in the middle of a roasting pan. Set chicken on top of open beer can and bake in oven for 1 hour or until done. Baste chicken with butter throughout cooking. Chicken is ready tender, juicy, and ready to eat! Serve chicken with rice or rice & peas.